Drink from the water of the waterfall in the mountains to get the following message. In the mountains, in the screen after the yeti's cave, LOOK VALLEY for a reference to the Half-Dome and Sierra: "That must be Daventry! But why is Half-Dome here?" you wonder. "But, of course," you think, "it's a Sierra game!". A glitch rather than an Easter egg: while falling in the pirate ship, type "jump ladder" and you'll be able to walk on thin air. SAVE first! Read the note behind the right-most tree in the screen north-east of where Neptune's trident is found. The note advertises Space Quest 1 and King's Quest 3. - When you talk to one of the guards at the Deltaur, he will eventually ask you if you've played King's Quest II (which gets you points). The player also asks him if he played King's Quest 3, which he confirms to have bought for 128,000 buckazoids. The guard also names his favorite massacre: "The Daventry Rout". When reading the newspaper in the briefing room, there is an article about a 3-headed dragon in Daventry, referring to the dragon to which Rosella is being sacrificed at the end of King's Quest III. Look at the moose on the wall for a reference to Sierra's prop department. Moose heads have in fact been used several times in Sierra games: in Lefty's Bar in Leisure Suit Larry 1 (AGI), in Manannan's dining room in King's Quest 3, and possibly other games. Look at the moose in Lefty's bar to get a reference to King's Quest 3. Talk to Celie's chickens to get a reference to King's Quest III. - Ken Williams, the game's executive producer and founder and CEO of Sierra has a cameo in Lefty's bar. Notice the third person on the left with the moustache. Check the titles of the books in the Magic Shop. 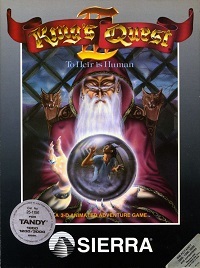 Among them is "To Air Is Human", a play with words on the title of King's Quest 3: To Heir Is Human. Other titles include: "The Pizza Elemental: Fact or Fiction?" and "Gnome With The Wind". In the game's resource file, there is a reference to King's Quest 3 in text032, which refers to Larry's cabin on the cruise ship. The text reads: "You feel nothing but dust. (But remember this if you ever play King's Quest III.)" It refers to the cupboard in Larry's cabin. In King's Quest 3, Gwydion looks on the top of a cupboard to find a small key - hence the reference. Unfortunately we have not yet been able to trigger this Easter Egg in Larry 2 as it appears this line of text as not linked to any command. If you do know the command that triggers it, please let us know!